Ufone New SIM Offer 2019, Subscription, Validity, Charges, Free Minutes, SMS and MBs of internet. Ufone brings new sim offer for the new users who are interested to purchase the new sim. The new sim offer by Ufone is one of the best offers as it is letting you enjoy a bunch of free minutes, SMS and MBs of internet. You just need to purchase a new Ufone SIM in order to avail the offer and after switching the sim in to your mobile phone you will get free minutes, SMS and MBs of internet on the recharge of just Rs.50..
To subscribe dial *1000# after purchasing the new Ufone SIM and load of Rs.50. Users need to dial *1000# to get Ufone free minutes, SMS and MBs after purchasing the new SIM or Port in within the 30 days of offer. For the next 60 days, on every recharge transaction of minimum Rs. 50, customer will get 500 U minutes, 25 minutes for other local networks, 500 local SMS and 1000 MBs internet valid for 5 days. Free 500 minutes are only for calling all Ufone and PTCL numbers. Free 25 minutes can be used to call all other local networks. You can use the free 500 SMS on all local networks. Ufone New SIM Offer 2019. 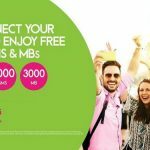 Ufone New SIM Offer 2019, Subscription, Validity, Charges, Free Minutes, SMS and MBs of internet.